This great floral piece is definitely a bit of a two-fer. 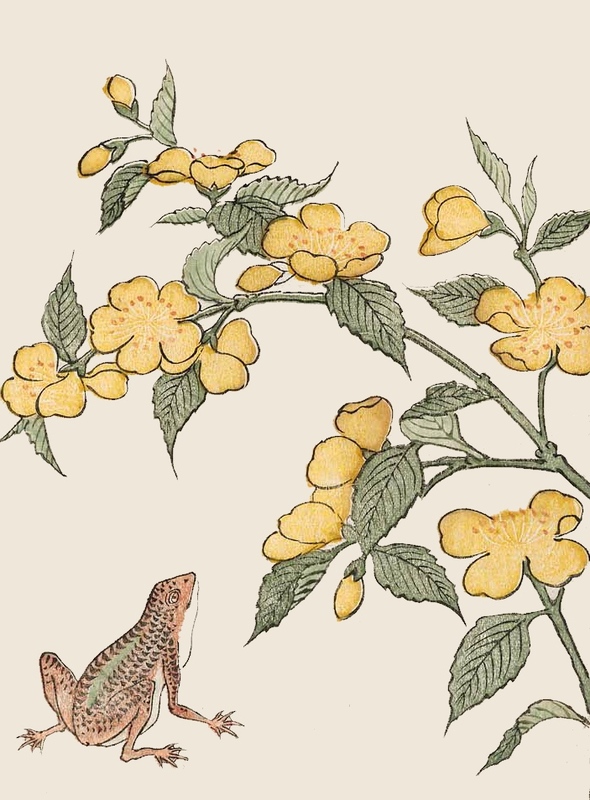 You get the beautiful Oriental yellow flowers and you get a charming little frog too. It is the work of Katsuma Ryûsui called Yama no Sachi or Luck of the Mountains. I think it is we, rather than the mountains, who are lucky. His watercolor pieces are so lovely and thankfully a number of collectors have Katsuma Ryûsui’s work since it was published in 1765. I’m not sure what kind of yellow flowers we have here but they are certainly sweet and remind me of spring. Buttercups come to mind. If you would like to use just the frog, I’ve shared him under Oriental frog drawing.